AND when I can goto the WSDL Location (https://zendsoap.lan/Zend_Soap_Server.php?wsdl): Everything looks fine. <faultstring>SOAP-ERROR: Parsing WSDL: Couldn't load from 'https://zendsoap.lan/Zend_Soap_Server.php?wsdl' : failed to load external entity "https://zendsoap.lan/Zend_Soap_Server.php?wsdl"
Loads of thanks for your help. 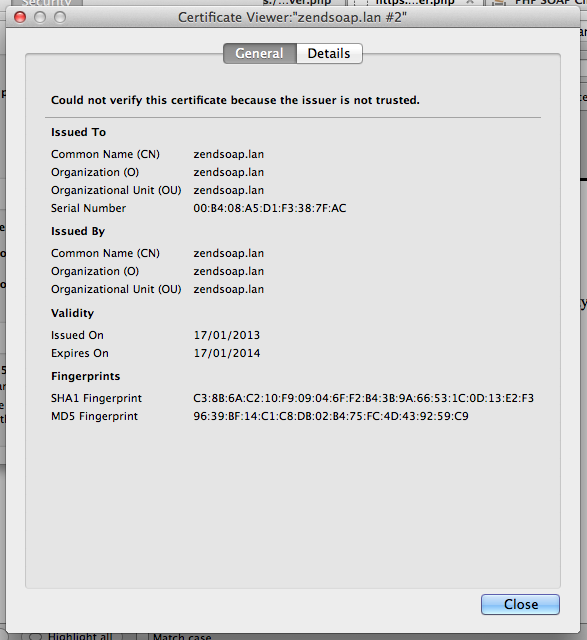 Can you (@dkcwd) please tell me what should be the code if I use Zend_Soap_Client without file_get_contents(). I mean is there any option which i can't find on internet to do something similar to 'verify_peer' => false. When I try to call https://zendsoap.lan/Zend_Soap_server.php?wsdl its works fine I can view the wsdl. The reason I made verify_peer=>false as I am running it on dev server so no need to verify my own created certificate, but obviously on production I want the Certificate to be verified. This thing work fine with NuSoap but most of the stuff in NuSoap is deprecated for our server which is running PHP 5.4.6, So the most reliable solution for me using PHP's SOAP extension. And the reason for me using Zend is we're in process of moving our system from some third party framework to Zend Framework and everyday I get requests from client to add this & that new components, I assumed if I develop every new request from Client using Zend libraries then it will be easy for me in later stages to move to Zend Framework. I hope I made some sense there. Not the answer you're looking for? Browse other questions tagged php zend-framework soap ssl or ask your own question.